Animal manure has been used in vegetable gardens for centuries. It adds nutrients and organic matter to the soil and aids in the development of a healthy, living soil. Lately, there have been several health scares linking the use of manure as a fertilizer to breakouts of E. coli (Escherichia coli). 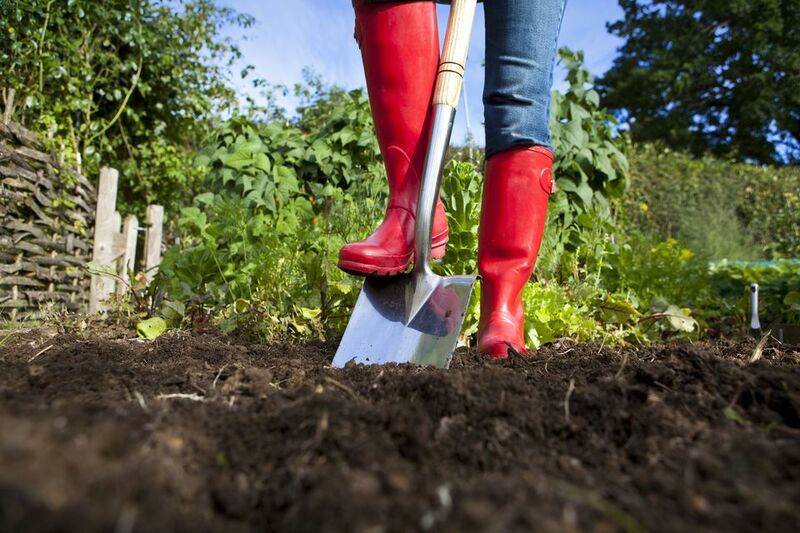 Is it too risky to add manure to a vegetable garden? Can E. Coli Infect Plants? According to University of Illinois Plant Pathologist, Nancy Pataky, the bacteria that is already on plant roots, as well as bacteria and fungi in the soil, would compete with E. coli and keep it in check, perhaps even feed on it. "Additionally, no research has indicated that the E. coli bacterium is anything more than a surface contaminant." Can Disease Be Transferred From Animal Manure to Humans? Yes, it's quite possible for manure to spread disease to human beings, although there have not been many long-term studies involving manure and home gardens. According to Van Bobbitt and Dr. Val Hillers of Washington State University Extension, "Pathogens (microorganisms which cause disease) can be transferred from animal manures to humans. The pathogens salmonella, listeria, and E.coli 0157:H7, as well as parasites, such as roundworms and tapeworms, have been linked to applications of manure to gardens." As for E. coli, contamination can occur when any type of food comes in contact with animal feces. This problem is not confined to fresh vegetables. There is always the risk, but there are some precautions you can take. Don't use fresh manure. The fresher the manure, the more of a chance it will be high in nitrogen and ammonia, which can burn plant roots and even inhibit seed germination. If the manure is from a plant-eating animal, it is probably also full of weed seeds, which will not be inhibited from sprouting. If you still want to make use of fresh manure, don't apply it after your garden has been planted. The U.S. Department of Agriculture recommends an application window of 120 days prior to harvesting and eating any vegetable where the edible part comes in contact with the ground. That includes anything grown below the ground (beets, carrots, potatoes, radishes, etc.) as well as anything sitting on the ground, like lettuce, spinach, and even vining crops like cucumbers and squash. You can apply fresh manure up to 90 days for vegetables that are far enough away from the soil that nothing will splash up on them but err on the side of caution. Instead of using manure as a fertilizer, use it as a soil conditioner. Add fresh manure in the fall, for spring planting. It will have time to work into the soil and compost. Wait until all vegetables have been harvested before adding. As a substitute, side dress with composted manure during the growing season. Manure that is composted lessens the risk of contamination, especially if the pile heats up to 140 F or more. You can purchase composted manure or, if you have a source of fresh manure, compost it yourself. Stephen Reiners, Cornell University horticulturist, says hot summer temperatures will usually kill E. coli. If you are getting your manure locally, inquire at the farm if their animals have had any health problems. If you are buying packaged manure, the bag should state whether it is pathogen-free. Don't assume that just because it is sold as fertilizer that it is fully composted. Any precautions related to using manure also apply to using manure tea. Since root crops (beets, carrots, radishes) and leafy vegetables (chard, lettuce, spinach) are the most susceptible to contamination, be sure to wash all vegetables well and possibly peel before eating. Cooking will also kill pathogens. If you have been susceptible to foodborne illness in the past, avoid eating any uncooked vegetables fertilized with manure. Children, pregnant women, people with weakened immune systems, and people with chronic diseases should also avoid eating them. Thoroughly wash your hands and nails before and after harvesting produce grown with manure. The nutrient value of manures varies by animal. Chicken manure is considered to be the most beneficial for your garden, with an N-P-K ration of about 1.1–0.8–0.5. Compare that with cows at 0.6–0.2–0.5 and horse manure, 0.7–0.3–0.6. Of course, even within species, the quality of the manure will vary. Most sources recommend avoiding the use of pig manure, as well as cat and dog manure, in the garden, because of parasites that can survive in the soil and infect humans. That is one of the reasons we are encouraged to keep our pets out of the vegetable garden, or at least train them not to think of it as a litter box.